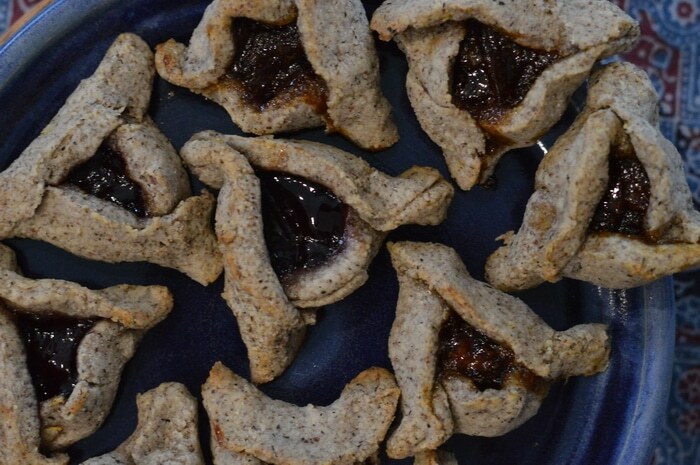 Gluten-free hamantaschen are quick and easy to make with little fussying. Whip up a double batch so you have some to eat and some to share with friends. 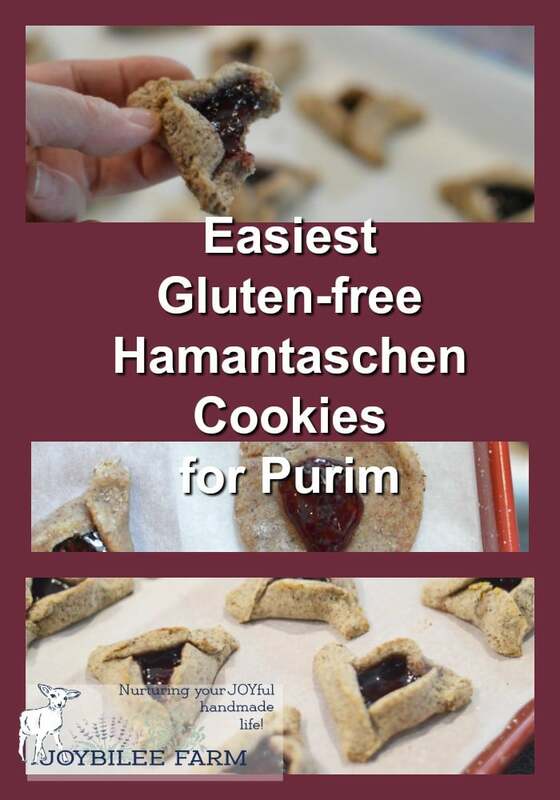 Even those who can eat regular hamantaschen will enjoy the flaky, pastry texture of these gluten-free purim cookies. Hamantaschen are the traditional cookie served at Purim, which is a joyful celebration of the victory of the Jewish people over those who wanted to annihilate them in the 5th century BCE. The story is recounted in the Bible in the book of Esther. Each year during Purim, observant Ashkenazi Jews read the book of Esther, have a costume party and act out the Esther story, and eat hamantaschen. The 3 cornered hamantaschen is symbolic of Haman’s hat or some say, Haman’s ears. Haman is the villain in the Esther story, so the eating of hamantaschen is sweet revenge. 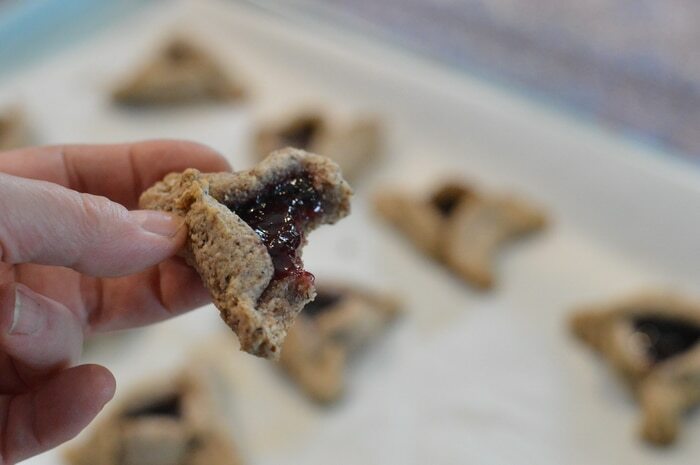 While traditionally hamantaschen is made from wheat flour, for those who have allergies, gluten-sensitivities, or celiac, traditional hamantaschen are off-limits. But honestly, this gluten-free version is easier to make and tastes better that regular hamantaschen. It even has a nicer texture. One advantage of gluten-free flours is you don’t need to worry about over-working the dough. Cookie dough needs to be rolled and cut several times before all the dough is used up. With traditional hamantaschen this can mean that the last cookies rolled and cut are not as tender and flakey as the first cookies. But with gluten-free cookie dough this is never a problem. You can roll and cut and even re-roll the dough until you get the shape you want. The dough has no gluten so it never gets tough from over-handling. I used a combination of almond flour and gluten-free all-purpose flour blend in this recipe. The brand of gluten-free all-purpose flour I used is Cloud 9, which is certified gluten free and certified Kosher. Mine came from Costco in Canada. Other brands of gluten-free all-purpose flour blends would also work on a cup for cup basis. Gluten-free flour takes time to absorb the moisture in the recipe. So it may feel as if this recipe is too moist when you are working with the dough. Once you’ve added all the flour, eggs, butter, and other ingredients the dough will be sticky and it might even stick to your fingers. Don’t be fooled. If you are used to working with regular wheat flours, you’ll want to add more flour at this stage. You’ll think a mistake was made in the ingredient list. DON’T DO IT. Instead rest the dough. That’s right. Put a lid on the bowl. Put it in a cool spot like the fridge, a cooler room in the house, an unheated bedroom. Then wait at least 2 hours. You could even leave the dough overnight. Wheaten flours wouldn’t respond well to this abandonment. They’d crack up. But not so with your new friend, gluten-free dough. When you bring the dough back into the warm kitchen this gluten-free cookie dough will be just the right texture to roll easily with just a scant sprinkle of a little gluten-free flour on the pastry board. And if you make a mistake and need to reroll the dough. No issues at all. Gluten-free dough won’t seize up or become stiff and tough. The last rolling bit of dough will be just as tender and flaky as the first rolled cookies. No lie. How are these the easiest hamantaschen? There is no need to make the filling for these yummy cookies. Just grab the jam you made last summer and fall. Do you have left over bits of jam in your fridge? Use that. Do you have a bit of leftover caramels or ginger chews? Use that. These also taste fabulous with the slight bitterness of lemon jam or marmalade. Plus you only need to measure two flours – almond flour and all-purpose flour. No need to mix your own gluten-free flour unless you want to. So don’t wait any longer. These will make your gluten-free family member feel like part of the family, as you celebrate Purim. In a small bowl mix together sugar and butter until light and fluffy. Add eggs and vanilla and beat until well blended. Add ground flax seed and mix until flax seed is fully mixed. Allow the mixture to sit for 5 minutes. Add lemon zest, almond flour, and gluten free flour. Blend well. The dough will be moist and appear to need more flour but trust me. It doesn’t need any more flour. Cover and refrigerate dough for 2 hours or overnight. During this resting period the flour will absorb any excess moisture in the dough and the dough will be soft, pliable and hold together well. Remove the dough from the refrigerator. Place the dough on a counter top that is floured with a scant amount of gluten-free flour blend. Work the dough by folding it over on itself a few times. Form it into a round mound. Roll it until the dough is no more than ¼ inch thick. 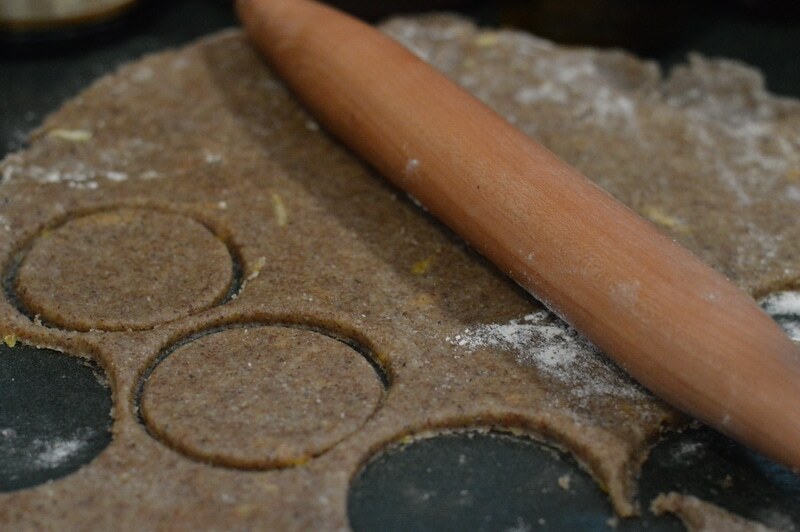 Cut with a round cookie cutter or the edge of a glass, to make circles of dough. Prepare a baking sheet by covering it with parchment paper. There is no need to grease or flour the baking sheet if you are lining it with parchment paper. Place 12 dough circles on the parchment paper. Soon ½ teaspoon of homemade jam, jelly, or candy into the center of each dough circle. Mentally divide the edge of the circle into three equal sections. Lift one cookie edge over the jam filling. Lift the second side of the cookie edge, so that the first edge comes under the second edge, where they join. Pinch lightly to seal the corner. Lift the third side of the cookie edge. Tuck the third edge over the second edge and under the first edge where they meet. Pinch lightly to seal the dough on the remaining two corners. One hamantaschen formed. Repeat this folding technique with the other circles of dough. The Cookie will be somewhat triangular with a jam or jelly pocket. Repeat with the remaining dough. Bake the cookies at 400°F for 14 minutes or until golden brown. Cool on a cooling rack. Serve with coffee. Make some for a neighbor. 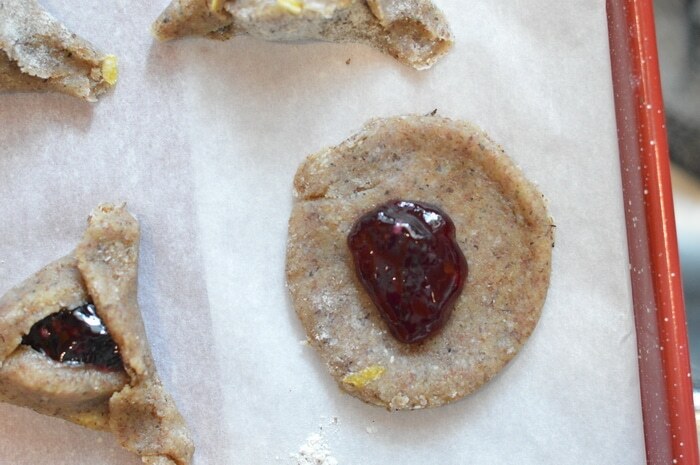 These gluten-free hamantaschen can be mixed in just a few minutes. With only 20 minutes of hands on time and a little bit of waiting, this recipe can be varied simply by varying the filling. Try pineapple jam, grape jelly, lemon marmalade, chocolate spread, peanut butter, or even caramels to make your cookie tray look like you spent hours creating awesomeness. Only you’ll know how little time it actually took. Recipe can be easily doubled. Allow more time for rolling, filling, and folding the cookies, if you double the recipe. Serve with coffee. Make some for a neighor. Another tradition of Purim is to give food gifts to neighbor and friend. 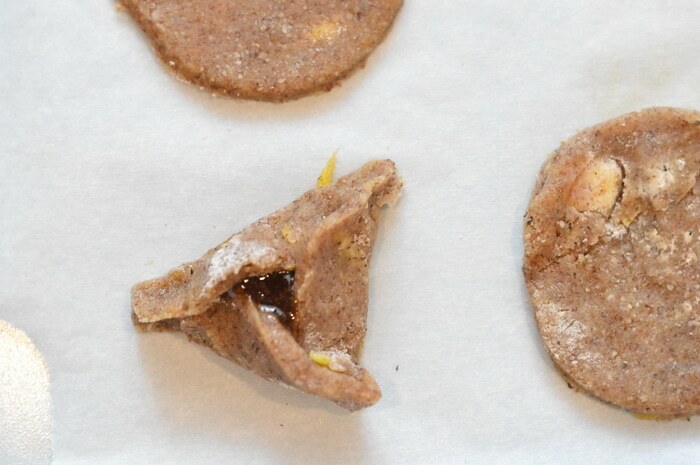 Make a double batch of these gluten-free hamantaschen so you’ll have plenty to give as gifts. Because I promise you, if you make only one batch, you won’t have many left over to give as gifts. Most gluten free baked good recipees don’t work for me because my dietary restrictions requires substituting a few basic ingredients. Amazingly and great fully, your recipe worked for us, and was both delicious and easy even though I had to sub out the eggs.